My dear friends and readers, forgive me for my silence over the last few weeks, I consciously wanted to take some time off writing and detox my brain a little bit, while on a summer holiday. It doesn’t mean that I stayed completely idle though, as I packed Sarah Chapman‘s first supplement ( called Skinesis Overnight Facial Supplement ) with me, to see if on my laid-back holiday, where I won’t necessarily have a chance to make fresh juices and smoothies daily, a tablet and a pill can make a difference to my skin, as well as my sleep. To make the testing process relatively bias-free, I left all of my usual supplements at home, apart from my matcha green tea, from which I refuse to be parted, particularly as sunny holidays make me want to up my antioxidant protection of my body and skin. Sarah is known to be a perfectionist who doesn’t launch any product until she is happy with it, so her first supplement has truly taken years to create. It blends together 23 micro-nutrients that promise ‘to support and hydrate the skin while you relax and sleep soundly‘, so all you need to do is take one tablet and one capsule with water, before you go to bed – I took mine an hour or so before going to bed, with a medium-sized glass of water. Our skin is a reflection of many things, so if you daily diet is rubbish, you are stressed, you don’t drink enough water and lack sleep, all of those factors will contribute to lacklustre appearance. I am not going to say that a supplement will sort all of the voes, but I believe in small changes that lead to a big shift, hence my curiosity and willingness to try this supplement. Omega Oil from Flaxseed & Seabuckthorn Fruit Source ( incl. Alpha Linolenic Acid/Omega 3, Linoleic Acid/Omega 6 and Oleic Acid /Omega 9; help improve luminosity and smoothness of the skin). 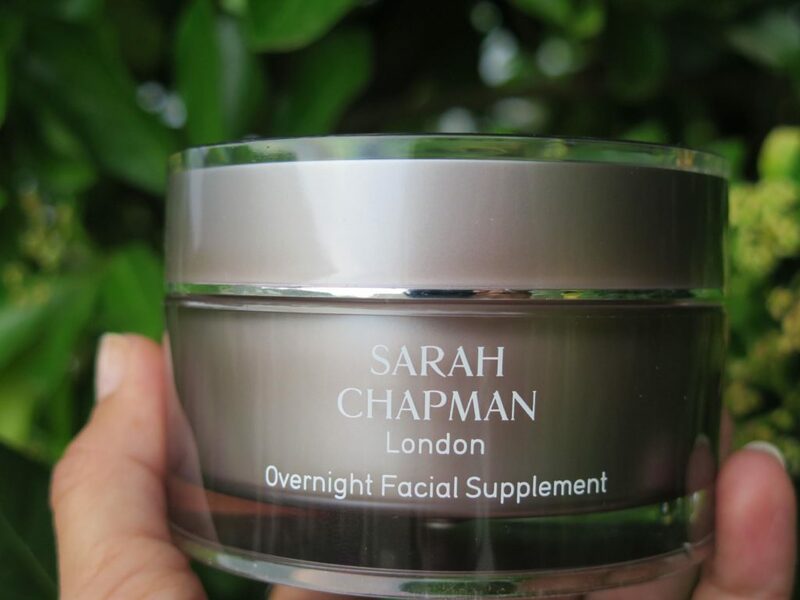 One of Sarah’s best-selling products is called Overnight Facial and is has a very loyal following among women of different ages ( personally I prefer her Morning Facial which makes my skin so dewy, I happily leave home with no foundation or BB cream on ). In a way this supplement was created to partner the Overnight Facial, fusing together skincare and nutrition, so Sarah consulted Victoria Health co-founder Shabir Daya, who is widely known and respected in the industry, in order to find optimum ways to help our skin and body to repair, revive and renew itself more effectively, while we sleep. As I regularly spend too many hours of my work day in front of my computer, as well as on Social Media, I know that it makes my body more high-wired, so a combination of Magnesium, Vitamin B6 & 12, as well as Lavender and Hops ( I wonder if it hails from Britain ? ) definitely contributed to my overall feeling of peacefulness. After taking the supplement for about three weeks I also noticed that my sleep was deeper and I woke up feeling more refreshed. Yes, I was on a sunny holiday, having fun with family and friends, but I did go to bed late as well, so I would say that to me the improvement was innately felt and much appreciated. Another somewhat negative thing that I will admit to, is that not always did I drink enough water, once I was away from the sea and the beach, even though I know that the sun & the sea can be both damaging and drying for the skin, but again, I was greatly supported by those two daily pills, in part thanks to Hyaluronic Acid, Lutein and Seabuckthorn ( being Russian I love this brightly orange and very potent berry & indulge myself in the summer and in autumn with steaming pots of seabuckthorn tea with honey ). I returned home relaxed, sun-tanned ( slathering myself daily with an SPF 50, mind you ) and happy. My hair was sun-streaked and my skin glowed. Did my holiday contribute to it? Without a doubt, but I also have to thank Skinesis supplement because it made up for my faults and short-comings, working overnight and hopefully undoing some of my sins, like not drinking enough water. A pill will never undo the damage from a bad diet and poor lifestyle choices, but taking a high-quality supplement can contribute to beauty changes from inside out. According to Shabir ‘supplements containing hyaluronic acid & EFA-rich facial oils will have a plumping effect on the skin. They are also one of the most important anti-ageing supplements’. At a time when we are bombarded with advertisements of supplements, this one whispers softly and helps you look and feel better, as well as have reduced damaging effect of daily free radical exposure in the most wonderfully subtle way.